A report released last year by the Journal of Developmental & Behavioral Pediatrics revealed an alarming statistic: more than 1 out of every 20 children and teens in the United States has been clinically diagnosed by a healthcare professional as having anxiety or depression. Further, the report shared that the number of children with diagnosed anxiety has increased in recent years. So how do we, as parents and special education professionals, address this trend in our homes and in our therapy jobs? Identifying triggers and finding ways anxious children to develop healthy coping skills are two critical components. This app is broken down into three parts, Breathe, Think and Do. “Breathe” introduces children to a technique for breathing deeply. “Think” encourages children to explore and understand their feelings, and offers alternative solutions for frustrating tasks. Finally, “Do” explains how to carry out the plan suggested in “Think.” Overall – this is a great tool to help young children (it’s best for ages 2-5) learn ways to process what is triggering their anxiety, and come up with possible solutions. Created by a psycho-motor therapist, this app guides children through meditation techniques, and includes soothing nature sounds along with easy to understand instructions on visualization, body scans and breathing exercises. Physical activity is a great way for children to relieve anxiety, and mindful posing offers children several stances to help strengthen both body and mind. The “Superman pose” is a stretching pose with legs spread as wide as the hips and arms over the head. This pose allows children to be in the present and focus on using their “Spidey senses” for the world around them. In the “Wonder Woman pose,” legs are spread apart, chest is out and hands are placed on the hips in a modified mountain pose. With both poses, it’s important to breathe deep while repeating mantras such as “I am happy,” “I am unique,” and “I am calm and peaceful.” Practicing these mindful posing exercises can help children (and adults as well!) to build up their emotional regulation and cognitive focus. There are a number of games that parents, behavioral therapists and other school-based therapists can do with children to increase observational skills, concentration and relaxation. In fact, many of these activities are old-time favorites that have largely gone by the wayside in favor of digital entertainment. For children with anxiety, we think they are well worth revisiting! Blowing Bubbles – One major benefit of blowing bubbles is breath control and learning how to slow down and breathe deeply. Playing with balloons – Keeping balloons in the air allows children to stay active, while focusing on keeping balloons afloat is an excellent concentration tactic. Blindfolded taste tests – Using all the senses (sight, hearing, touch, smell and taste) will keep children fully engaged. Choose a variety of foods to test in order to clearly distinguish one from another. Pinwheels – A breathing technique that allows for use of visual senses along with focus and concentration. Making Mind Jars – An easy, relaxing activity designed to shift the focus away from anxiety. Glitter glue, plastic jar, food coloring (or anything to thicken the water) is placed in a water bottle, shaken and turned upside down, much like a snow globe. Get creative by making them theme-based or catering to the child’s specific interest. 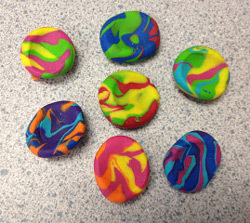 Worry “Reminder” Stones – Create worry stones by decorating oven-baked clay with positive affirmations or mantras. On a budget? Alter the activity to instead gather stones from outside, and have your anxious student decorate them with acrylic paint. What are some of the techniques YOU’VE found to be successful when addressing anxiety in children? Please share in the comments section below!